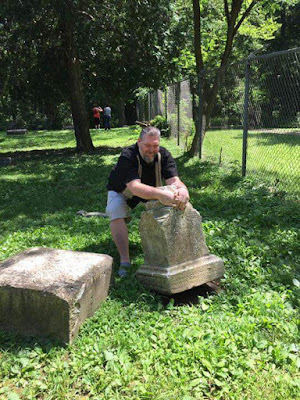 If you pay to go on a tour of a cemetery and during the middle of it you see someone tipping a headstone the odds of that person being yelled at are very good. They may even get kicked off of the tour. Not only did the man tipping the stone not get yelled at, he was surrounded by others in amusement. Now take a step back and think about that for a moment. Why did they feel comfortable about the headstone being tipped? Why did the man even bother to tip it? Out of all the other headstones inside Bachelors Grove cemetery he picks that one? Why? The late Richard Crowe once produced a documentary which included the legend of the “moving tombstone.” This legend, retold by the tour guide, prompted her to tell a personal story of the four men she was with that attempted to collectively move the very same headstone within the legend. She states the men could not even “budge it” and continues looking to the crowd of her customers telling them with a chuckle that if these strong men can't do it nobody else can. You think that there would have been a disclaimer by the tour guide, right? Why did the guide not tell everyone not to try it themselves? But on the other hand, why would you expect a disclaimer? The tour guide already told everyone she was involved in the attempted movement of the headstone so obviously it must be a reasonable thing to do. After all, the cemetery is a tourist attraction so tossing around a headstone must be part of the experience? To top it off, the tour guide tells everyone that she tried recording an EVP audio session during the time these four men attempted to move it. She doesn't have the recording with her for the audience, but states that she recorded a voice saying “don't tip me“ and that if they are interested they should contact her after the tour so she can send them a link to it. The drama continues as the tour guide and portions of her fan club gear up for a failed defense. First, a customer on the tour comes forward with a photograph of the man tipping the stone. Details of the video match the photograph of the man tipping the stone. Claims by the tour guide that the video is “fake” due to “editing” are quickly demolished. Then another customer comes forward, not to deny that anyone tipped the stone, but to make excuses for it. Other supporters of this desecration even went so far as to harass anyone on Facebook that dare to make negative comments about their precious tour guide. More hopeless defenders of this disrespect for the dead will certainly pop up to voice their failed arguments. But in the end, the video and photograph don't lie, and common sense will prevail for those with a level head on their shoulders. The tour guide is wrong for what she did, as well as how she has handled this situation so far in her attempt at damage control. The man tipping the stone is also clearly in the wrong, and anyone that defends him or the tour guide are hopeless fools.